Decided to do the Winterlicious Tag floating around YouTube and Blogger. Respond! Comment below with your own responses! Or do the tag and show me your responses! Questions! 1) Favorite Winter Nail Polish? 2) Favorite Winter lip product? 3) Most worn Winter clothing piece? 4) Most worn Winter accessory? 5) Favorite winter scent/candle? 6) Favorite Winter beverage? 7) All time favorite Christmas/Holiday movie? 8) Favorite Christmas/Holiday song? 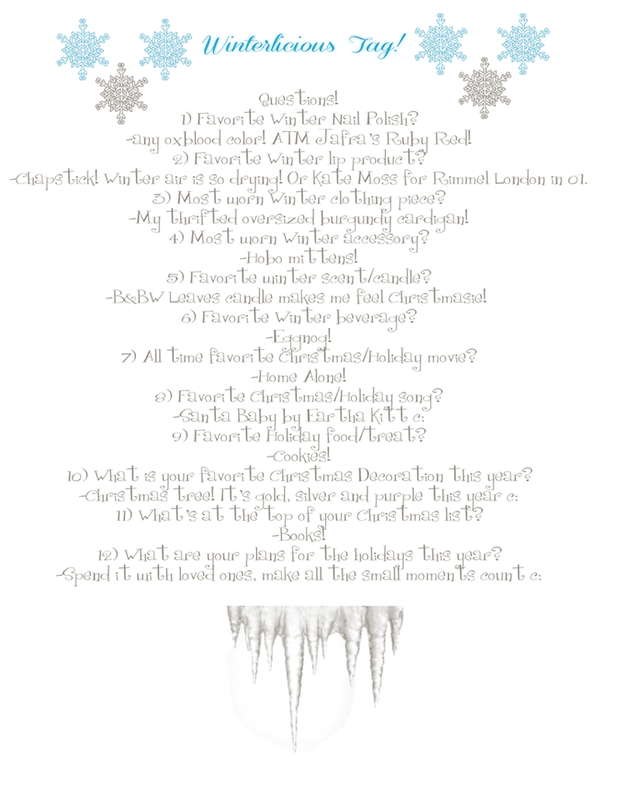 9) Favorite Holiday food/treat? 10) What is your favorite Christmas Decoration this year? 11) What's at the top of your Christmas list? 12) What are your plans for the holidays this year? How about following each other love ? Thank you sweetie (: I had already seen this tag on youtube and I think I might do it on my blog!